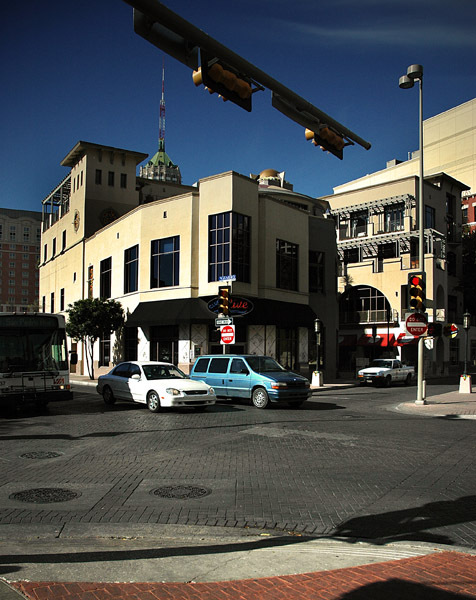 Photo "That corner of San Antonio"
Excellent details, colours and report! Excellent details, light and contrast!!!! i like the POV, a good angle you chose.. the image has the street atmosphere, and i also like the lights and shadows, Marv..
i was scrolling it, to see if that brown colour at bottom isnt too much attracting, and tried to crop bit there, without loosing that shadow, that is so interesting.. but really when i did, i was wrong.. i think it is well balanced all, my friend..
a kiss to you, and i answer your question about my last photo by mail!.. I think you got a firm and beautiful sense of space. I like this work. Beautiful contrast of color. Snapshot at finest my friend. regards.